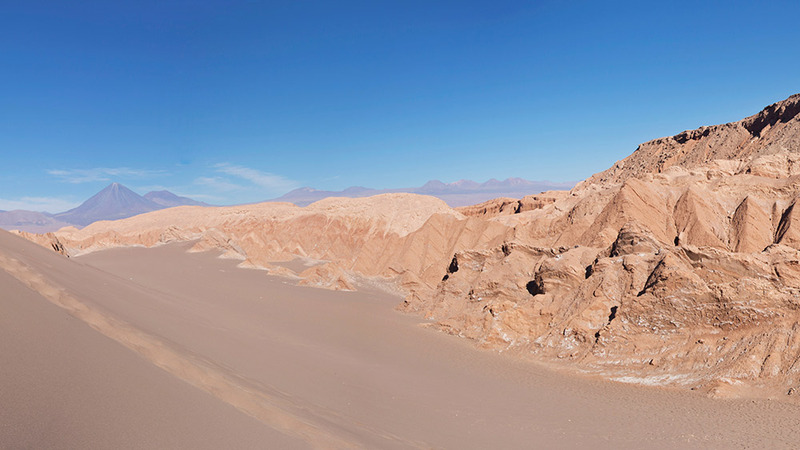 Atacama's otherworldly appearance and terrain have been likened to Mars. Its otherworldly appearance and terrain have been likened to Mars; so much so that it has been the location for many interstellar movies. Even NASA tests instruments for future Mars missions here. The lack of rain (an average of only 1cm or .04in per year in the entire region) has created riverbeds that scientists believe have been dry for 120,000 years, with smoking 35 million-year-old volcanic mountains of up to 6,705m (22,000 ft) that loom over it all. 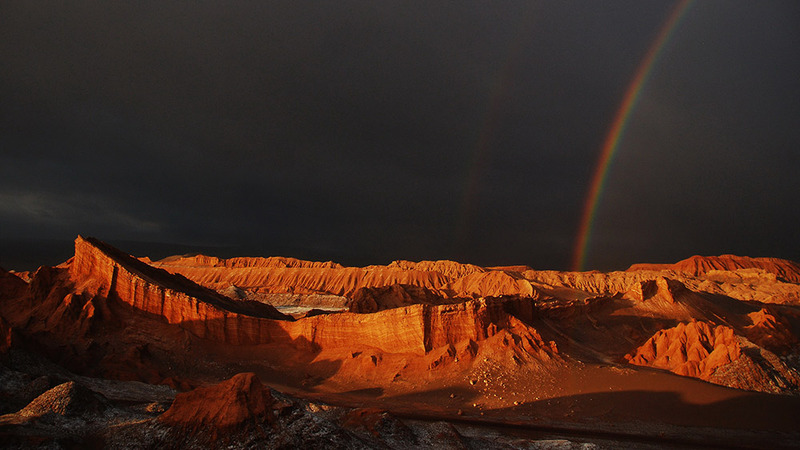 The Atacama Desert lies along the base of the Andes mountain range. The Atacama’s remoteness, altitude, minimal light pollution, and arid desert atmosphere make it one of the best places on Earth to see the galaxy above. Nights here call to stargazers like a magnet, with the clearest skies in the Southern Hemisphere. Once the sun begins to dip behind the peaks of the Andes, it sends an ever-changing colour palette across the landscape in one of nature’s most dramatic shows — followed by the brilliant star-dotted sky. The world’s most advanced visible-light astronomical observatory, Paranal, is located here. It is the flagship facility for the European Southern Observatory, and its telescope is so powerful that it could clearly show the two headlights of a car at a distance of the moon. Free guided, public tours of Paranal are held every Saturday; reservations are required. 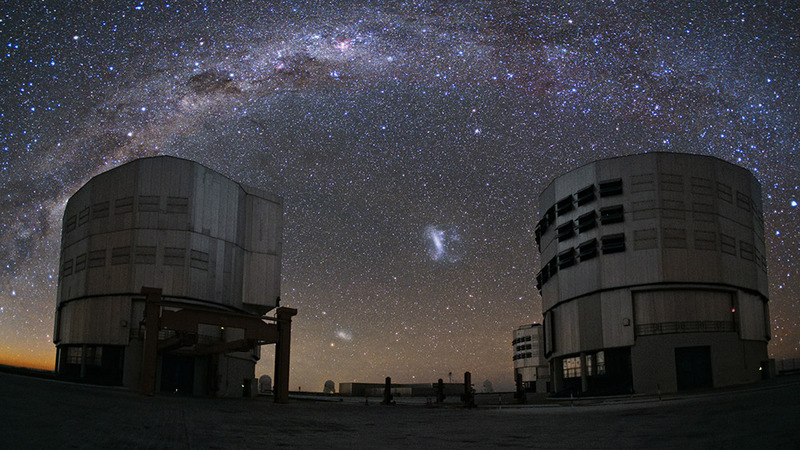 The world’s most advanced visible-light astronomical observatory. Photo courtesy European Southern Observatory. There are also plenty of other ways to get up close and personal with the starry show that the Atacama puts on. Stargazing tours in small groups are regularly held on clear nights, especially in the week around the full moon. These tours are fun and informational, and they allow people with little or no astronomical knowledge to observe and discover a new world above. You can also have a personal stargazing experience at local hotels. Some boast their own observation decks with lounge chairs, blankets, and research-grade telescopes, guests are led by knowledgeable guides who point out the major stars and constellations, so that they are free to explore the galaxy from their chair. Try for a one-and-a-half hour long Full Moon Walk starting here, which further explores the surrounding area. Arrive to the Valley of the Moon for sunset at take in its golden light. 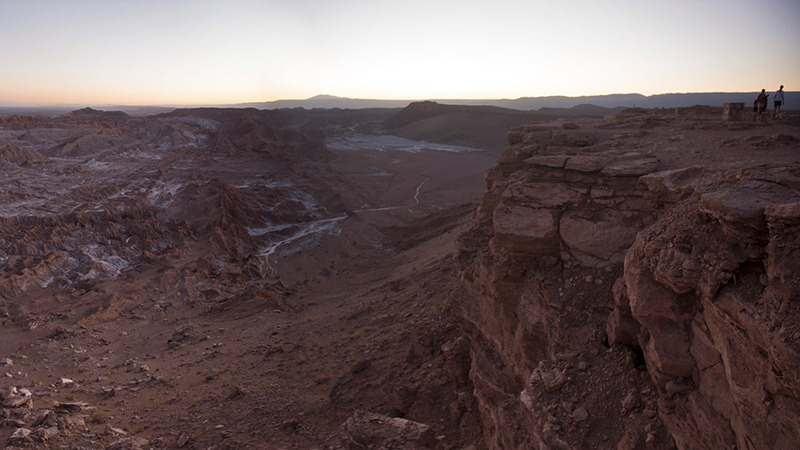 Photo courtesy Ricardo L.
Speaking of the moon, an extraordinary place to hike in the Atacama Desert is the Valley of the Moon. It’s best to arrive a couple of hours before sunset — which is spectacular here — so you have time for plenty of hiking through the rock formations and colourful striated mountainsides. As you may have guessed from its name, this area is the most lunar-like land in the region. San Pedro de Atacama San Pedro de Atacama This picturesque town is home to about 2,500 people, and is the archeological capital of Chile. 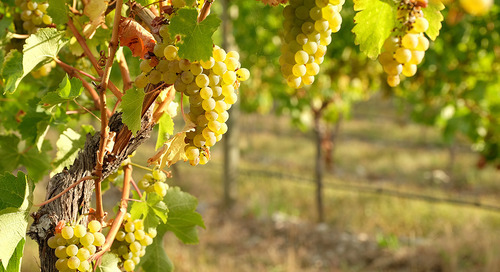 It is a quiet town that makes for a nice walking tour, with a number of artisan shops, a craft market, historic church, museum, and several good restaurants. Salar de Atacama The largest salt flat in Chile, and third-largest in the world, is as otherworldly as the Atacama gets. Here, jagged salt-crusted rocks rise from the ground amid shallow pools of the desert’s precious water. The salt lakes also hold the most incongruous, but enchanting, sight: dozens of vivid flamingos. Three species of flamingo live in the Salar, some of the only animal life outside llamas and lizards to exist in the ruthless climate. Explore Indigenous culture This forbidding geography is home to an incredibly hardy people with a long lineage in human history. Some mummified remains in Father Le Paige’s Museum at San Pedro de Atacama are the oldest in the world, pre-dating Egyptian relics by thousands of years. For a first-hand look at the history and culture of the region, hike up the Pukara de Quitor, a fort was built around 900 B.C. and used by the Atacameño until the Spanish overtook it centuries later. The fort is dotted with signs explaining its history of invasion upon the peaceful people, in both English and Spanish, and a climb to the top yields magnificent views of the desert gorge below. 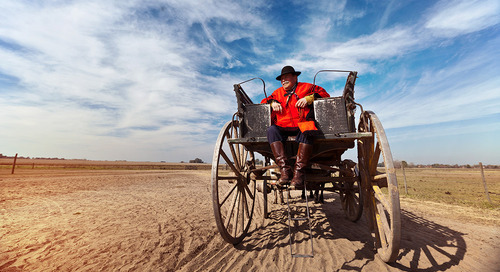 G Adventures runs a number of departures in Chile encompassing a wide range of departure dates and activities to cater to different tastes. We’re thrilled at the prospect of showing you this big blue planet of ours — check out our small group trips here. Feature image courtesy Alessandro C.